Stocks in the S&P 500 have returned an annualized 22.2% since the bottom of the crash in March 2009. That’s more than three times the annual average return on stocks over the last three decades but there is every reason to believe that the good times will not last long. In fact, four catalysts are about to hit stock prices and only one asset is set to provide safety and growth over the coming years – precious metals. An investment in precious metals has proven to provide strong returns at this stage in the business cycle and it could be the best decision you make all year. After six years of strong returns to stocks, even the most optimistic on Wall Street are admitting that shares are ‘fairly valued’ at best. While there’s no way to tell how well stocks will do in the near-term, there is an intuitive reason precious metals will be a better investment. Stock prices tend to hover around an average of 16 times the earnings of companies over the last year. Buy in when shares are cheaper than this level and you’ll benefit when values increase. Buy in when shares are expensive and you’ll likely get burned. Stocks on the S&P 500 are currently trading between 20 times and 21 times trailing earnings. Using data since 1988, the chart below compares the price-earnings ratio with subsequent returns on stocks over the following year. 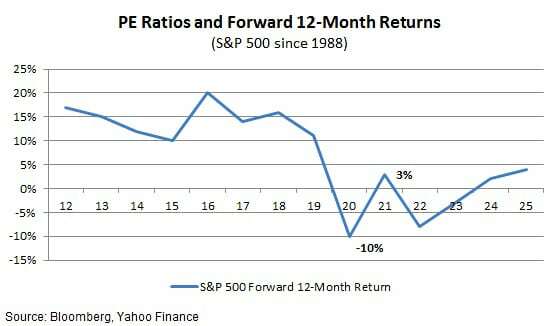 Once stocks pass the 20-multiple threshold on price-earnings, forward returns over the next year are about 4% at best and as low as a 10% loss. In another study of data since 1925, fund manager Vanguard found that annualized returns over ten years averaged just 4% for stocks when the price-earnings ratio was this high. On its store of value, an investment in precious metals will generally increase by at least the rate of inflation, right now just under 2% a year. Beyond the base increase from inflation, precious metals also benefit from increasing demand as an investment and for jewelry. The price of gold has increased by an annualized 9.8% over the decade to July 2015, slightly higher than the 9.6% annualized return in silver. An investment in precious metals could provide double the return – or more – compared to stocks over the next few years. The low point in the last business cycle hit in June 2009, more than six years ago. The average of 11 business cycles from 1945, from the previous low point to the peak, was 58 months. That means this current cycle is already more than 15 months older than the average. It’s true that business cycles do not die of old age but this one could be facing some serious downside catalysts. Fed Chair Yellen recently delivered a speech to the Greater Providence Chamber of Commerce, noting that rates will be increased this year if the economy continues to improve. Yellen dismissed the sluggish first quarter economic numbers as transitory and pointed to several factors that showed faster growth in wages was on the horizon. Higher rates means higher interest expense for corporations and lower profits, as well as lower demand for consumer credit. All of this has a depressing effect on the economy. 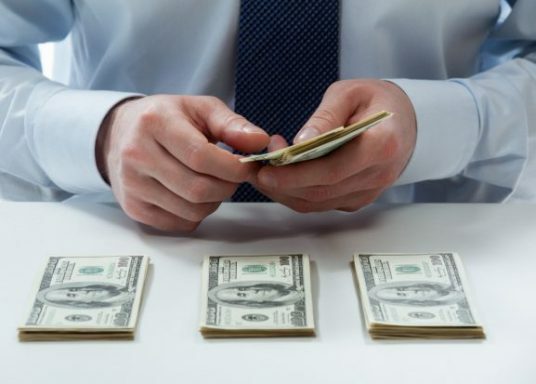 Research by the National Bureau of Economic Research found that higher rates start to affect economic growth between 6 to 18 months after the increase. While the market loves to fixate on the monthly jobs report and the unemployment rate, the weekly unemployment claims report has proved surprisingly effective at predicting recessions. The chart below shows the four-week moving average of continued claims, people that have been on unemployment benefits during the prior week and are still unemployed. While the continuing claims data leaves out different segments of employment activity, it has been a strong predictor of the economy. 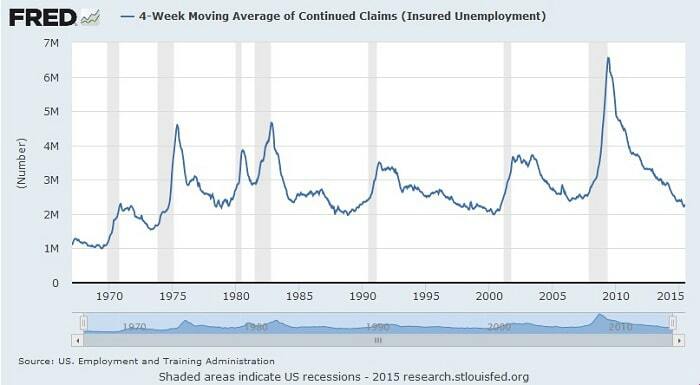 Since the late 1970s, the economy has always stumbled when continuing claims reached around two million on a four-week average. The reason is unemployment’s connection with economic growth and wages. When unemployment is low, the economy is growing and wages are likely heading higher as employers need to offer more incentives to workers. It’s usually right around this time that the Fed is considering increasing rates to cool economic growth. Wage pressures hit corporate profits right when higher rates are decreasing consumer demand, a double-whammy that almost always drives a recession. The coming end to the business cycle will devastate stocks, leading to losses as high as 50% as seen in the prior recession. Precious metals not only hold their value during a recession but provide strong returns as investors rush to the safety of real assets. To hear all the talk about Greece and the fear that a default on its bonds would lead to a major stock market correction, you would think the country was a global economic linchpin. In fact, Greece’s $285 billion economy is about the same size as that of the Miami metropolitan area. While the market has cheered the news of a deal for Greece, the fact remains that just about anything is being used as an excuse to send the market lower these days. Puerto Rico missed a $94 million payment on its $72 billion in municipal bonds earlier in July and the governor has already said that the debt is unpayable. The market has yet to react on the new risk and send rates on other municipal bonds higher, but we could see significantly higher rates when it does. This would make it prohibitively expensive for a lot of local governments, especially if higher rates hit at the same time the general economy is shrinking. Analyst Brian Ford recently previewed the coming collapse in the municipal market as America’s Greece times ten! If Puerto Rico isn’t enough, the market still has the recent plummet in Chinese stocks and the slowing economic growth in the world’s second largest economy. Europe is still barely growing but civil unrest is definitely growing. When the markets get this edgy, the only thing investors can do is seek protection in assets like precious metals and wait for more rational times. Even as the Fed scales back its historic money-printing program, Japan and Europe are still feverishly pumping money into their economies. The European Central Bank has just begun its monetary program to pump more than $1 trillion into its economy over the 18 months to September 2016. The Bank of Japan, bent on an explicit inflation target, is pumping 80 trillion yen into its economy every year. The rate of global inflation has moderated lately, estimated at 3.4% in 2014 by PWC, but could be about to jump higher than anyone expects. Central bankers are explicitly targeting higher inflation but as the saying goes, “inflation is like being pregnant, you don’t just get a little inflation.” Higher inflation in Europe and Japan is devaluing their currencies, prompting other countries to devalue their own currencies with lower rates. No one is ready for the aftermath of central bank manipulation and surging inflation. While stocks generally do well in very low inflation since companies can raise their prices, companies cannot cope with rapidly jumping prices. An investment in gold has beaten U.S. inflation by nearly 12% a year over the last decade and by more than 4% since 1971. From an end to the six-year business cycle to runaway inflation, stocks are set to provide disappointing returns over the next several years. Data shows that stocks are likely to see annual returns of 4% or less over the next decade. Investors have enjoyed strong returns over the last few years but it is time to re-position in assets that are set to do well in the coming economic reality. An investment in precious metals does well when market volatility increases, inflation surges and investors look for safety in real assets. 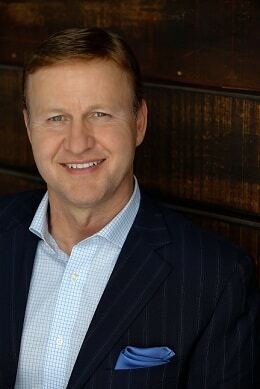 John Halloran is the CEO of the Certified Gold Exchange. To speak with John’s team and learn about the many methods available that can save you between 70% and 80% of your distribution tax, please call 1-800-300-0715 today.